Hi, I'm a student about to graduate with my associates in Electrical Tech. Every friday our class spends an hour looking at the pictures posted in this forum, they teach us alot about what not to do!! 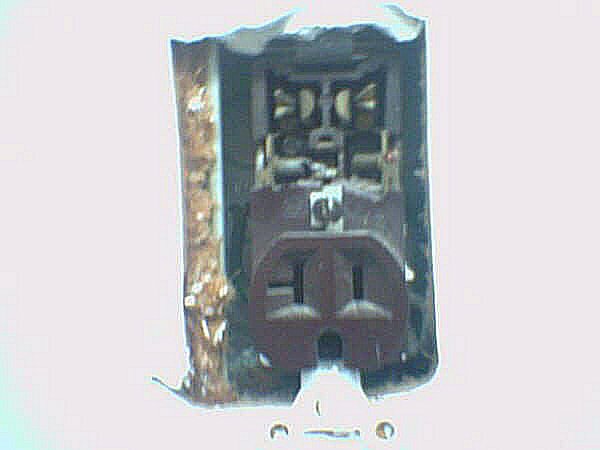 as you can see there is no cover plate and the entire top half of the receptacle is busted off. But it still holds a plug! OK, open mouth, insert foot. I'm going to guess that that cover was compression molded, probably of phenolic. The compression stuff is more brittle than the injection molded, and maybe the cure portion of the mold cycle or temp or both were a little off. So along comes Mr. Maintenance with a vacuum or a polisher, and when he's well away from the receptacle, he yanks out the cord. Do that with the lower outlet, and you tend to break the bottom of the ground pin hole out (like here). Do it on the top outlet, and, CRACK! Off comes half the cover. Isn't it embarassing for the school to have something like this in a CODE classroom? I hate to think how often I have seen receptacles like this. Wouldn't you think the liability alone would move property owners to have something like this fixed? The T-slot innards allows one piece to be used for both the hot and neutral side on the entire family of receptacles (5-15, 5-20, 6-15, 6-20). Yeah because some of the manufactering do that to keep the tooling cost down. but the biggest thing that some area just dont bother to change it unless someone tell the mantaince personalle to fix it or change it. I did see that few time in school building and have to fix it and end up using very hevey duty grade repecale to prevent anymore damage but it will happend sooner or later. That really is bad though, and I'm assuming none of the future-electricians are allowed to put a paw on it? The worst example of this I ever saw was in a university classroom. It was a floor receptacle, brass trim, cover flap long gone, full of crud of course. One of the students was walking around with bare feet. I was just there to give a lecture, but I put my plug tester in there and of course it lit up. T-slot contacts hold better, I have found. I have an antique Hubbell t-slot Edison base adapter. It holds plugs better than most of the garbage found today. Of course it may well date to the era when receptacles were a rarity, and you needed a base adapter if you wanted to plug anything in.